Usually you can repair this. It is the rubber stops that tear. There are two rubber stops, one or both may be torn. Re-glue them with quick drying RTV silicone, super glue, whatever. If you ran the power door locks too long like this, too many gear teeth may be broken off though and sometimes need the actuator replaced instead. One or two missing gear teeth won't usually cause much harm. If the rubber stop is too deteriorated to glue back, try finding some other piece of rubber to wrap around it or glue it to where the original rubber stop was located inside. – Note: An actuator is essentially just a motor with gears. 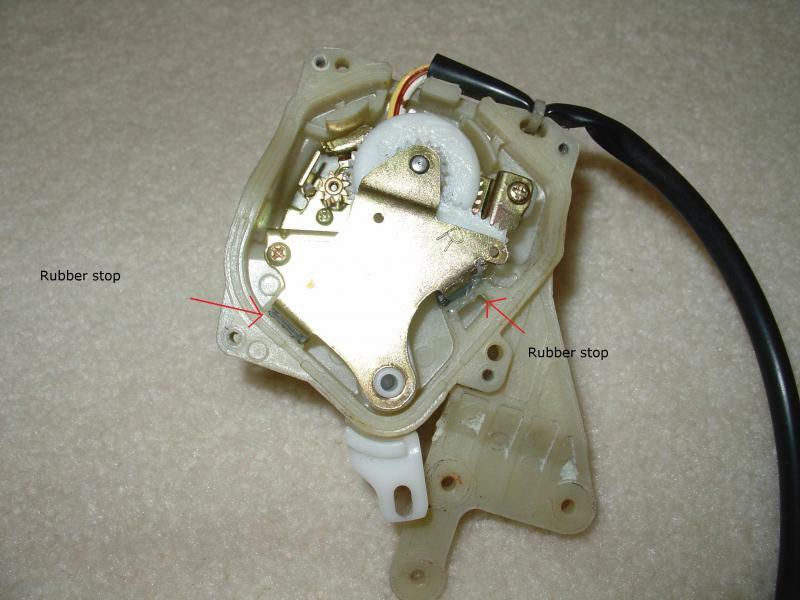 Inside this actuator are two rubber stops to limit the travel of the gears, one stop to limit for locking and one stop to limit for unlocking. 3. Do not remove the latch, only the actuator. It is quite tight; take your time (take breaks along the way and study it so you remember how it goes together when you re-install). The actuators on each door usually are different (left, right, front, back). 4. After you take off the door panel, remove the actuator from the latch, held on by the 3 phillips screws. You will need to remove a small black plastic shield/guard held on by one phillips screw to get better access to the 3 screws. (You do not need to remove the latch.) – See 2nd picture. One other tip: A magnetic tip screwdriver works wonders holding the screws in tight spaces. 5. After actuator is removed, turn over and remove 4 phillips screws to open. – See 3rd picture. 6. Glue the rubber stop back , let it dry. – See 4th picture showing rubber stops. 7. Close back up the actuator. 8. When reinstalling the actuator onto the door latch, hook the tab from the actuator onto the latch first, and then put on the screws. The tab I am referring to is the blue arrow – 5th picture. Last edited by redbull-1; 12-21-2012 at 09:24 AM. I think mine makes a buzzing sound and it doesnt lock or unlock unless I do it by hand. Would this work for that? Take off the door panel and examine if the latch rods are properly attached, and moving when you apply power to the actuator. 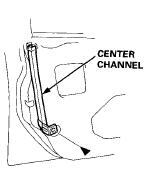 If the rods are properly attached, then it is the actuator. You can take out the actuator and open it up to examine the condition of the gear teeth and rubber stops. "If you ran the power door locks too long like this, too many gear teeth may be broken off though and sometimes need the actuator replaced instead. One or two missing gear teeth won't usually cause much harm..."
Thank you very much. I will have a look at it. I have been wondering what this was for a while now and this post is just what I needed! You're awesome! Just did this; about an hour total time. The actuator would cycle back and forth a few times after locking the door with the key, and intermittently the other three doors wouldn't unlock when holding the key in the unlock position as it's supposed to. Slide the center post down, off of the rubber window channel. Leave it in the bottom of the door where it's out of the way. A mirror will help find that phillips screw that holds the black cover on. Although it's pretty easy to get to, that screw can't be seen without a mirror. The rubber stops were in good shape on mine so I'm not quite sure what was (is) wrong with it. I levered the steel tabs in a bit in hope that the rubber had compressed, and bringing the rubber closer would help. Cleaned some plastic shavings out of the gears and put a little synthetic grease on the gear teeth. The locks work exactly like they're supposed to now but only time will tell if the "fix" took. Still good one month later. The rubber pads - even though they looked fine - must have compressed down to the point that the locks were cycling. Bending the steel tabs in slightly fixed it. Thanks again for the excellent instructions redbull. I want to thank all of you for this valuable info! 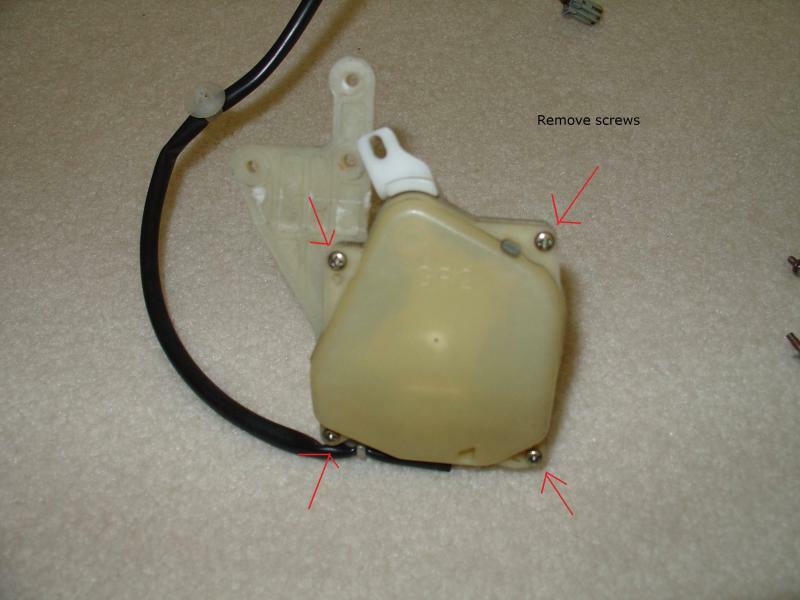 I replaced my drivers side actuator last weekend on my 1994 Accord! People aren't running for shelter anymore when I lock the door!! 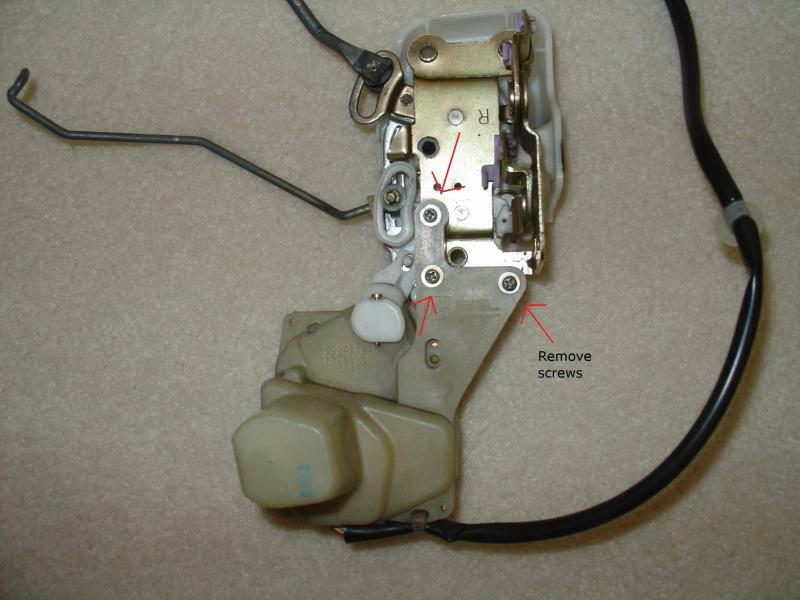 Successfully fixed the buzzing driver-side actuator on my '96 Accord coupe this weekend following your procedure. I bent the tab in a little (like Roader recommended) and used a small zip tie to hold the damaged rubber bumper in place. Seems pretty robust. Time will tell. Redbull-1, thank you so much for posting this fix!! Great info and help to the members..Thank You very much for posting it for everyone..